Obverse: Death, in a sailing vessel marked "Edward Grey", in the uniform of admiral, holding two flags, viz. one of Italy, the other of the United States. Between his splayed stance cowers Grey with a two-fisted death grip on the mast. The vessel is flying Dutch, Spanish and Danish flags. Below, 1915. 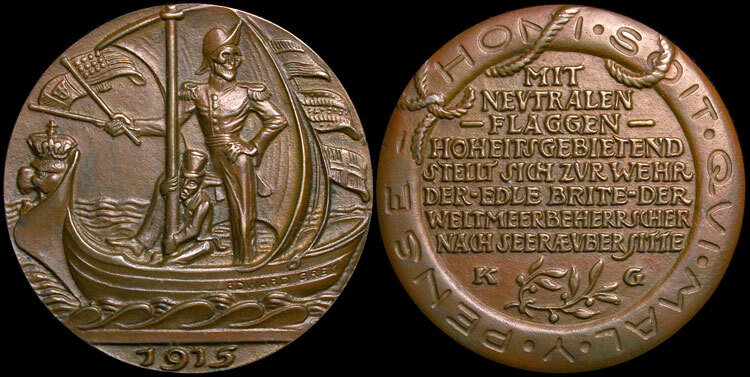 Reverse: Bordered by a life-buoy with device, "Honi soit qui mal y pense", inscribed, "Mit neu-tralen Flaggen Hoheits gebietend stellt sich zur wehr der edle Brite der Weltmeerbeherrscher nach Seerduber Sitte" (The noble Englishman ruling the oceans defends himself with the aid of neutral flags as is the habit of pirates).